Open: 9 AM to 9 PM EST. Mon-Sun. The Mobile-Lift Motorhome Model 20565 Is just like the Mobile Lift 19675, but was designed to work with motorhomes that have an extra high hitch receiver. It requires no disassembly of your 3 or 4 wheel electric scooter or power wheelchair. Simply drive the scooter or wheelchair on to the platform, attach the safety harness and push the switch. The Mobile Lift 20565 raises and locks any scooter into place on the back of your motorhome in just 60 seconds so you can be on your way. 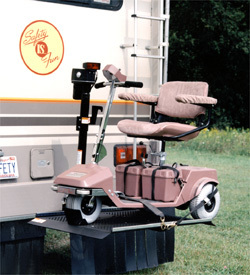 The Mobile Lift can be mounted on your motorhome by any local trailer hitch installer. It simply bolts onto a class 3 receiver hitch, and weighs only 62 lbs.! The lift comes complete with simple wiring and installation instructions, owners manual and a one-year warranty. All steel 12 volt DC motor with hardened, permanently lubricated gears. Also available in the "Big Tray" model (30" x 50" platform size) for larger 4 wheel scooters. Attaches easily to standard class 3 trailer hitch with 2" receiver. Lift power Runs on vehicle battery-wiring harness included. Weight of Lift 62 lbs. Hitch Height 19" to 21"
Simply lower platform to the ground and drive scooter onto platform. Secure scooter with straps, push switch to raise lift and your on your way! 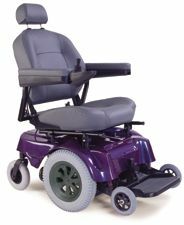 Optional heavy duty weather cover to protect your scooter or power chair from the elements.